This is a vintage bakelite bangle bracelet and pierced earrings. 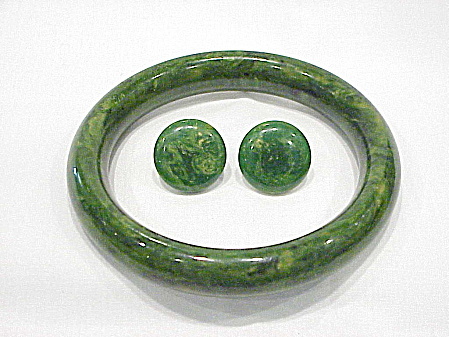 The bakelite is a dark marbled green color. All of the pieces have been tested with Simichrome. The bracelet measures 2-1/2 inches across the opening in the center. It is 1/4 of an inch wide. The pierced earrings measure 3/4 of an inch in diameter. The set is in very good condition but may need cleaning or polishing. Please let me know if you have any questions. Thanks for stopping by.